East Coast Music & Entertainment has a stellar reputation for providing top tier entertainment at fair prices in New York City, Long Island and the Tri-State Area. Our mission is to really listen to our clients and find live music solutions for every situation and budget. Recent additions and some "outside the box" thinking allows us to create packages at various key price points that are sure to meet your needs. We feel blessed to be in a business where smiling faces (and tired feet) are the company goal! East Coast Music & Entertainment also provides ensembles to accommodate ceremonies, cocktail hours, and just about any entertainment situation imaginable- including DJ and band/DJ combos. Our ever expanding New York network makes us an outstanding resource for anyone planning a family or corporate event. If we cannot handle a request in house, we will gladly refer someone who can. In the late seventies, Dan Vitalo, Jr. set out to bring something fresh, different and BIG to the then flourishing Long Island bar and college music scene. In a landscape dominated by pretentious four piece bands, he envisioned a fun, eclectic R & R band with both male and female lead vocalists and a horn section. His perseverance resulted in East Coast, an ensemble that has withstood the test of time and has now entered its fourth decade. Before leaving Long Island for the sunny beaches of St. Barts, Dan set in motion a project that has logged thousands of performances and involved many great area musicians. His insistence on horns and multiple vocals made East Coast a prototype for what has become the wedding and corporate performance industry standard. Current members Paul and John were Dan’s partners in the nascent venture and graciously tip their homburgs to the founding father: “If it weren’t for Dan, we would have missed out on some wonderful music, fun times and great camaraderie”. East Coast is now older than its youngest members but continues to build on the foundation laid by those who came before, bringing great entertainment to the latest generation of East Coast fans. During the ‘80s and ‘90s East Coast further developed its reputation as a high energy Party Band, building a loyal following throughout the tri-state area—from the Hamptons to Hunter Mountain. It was during this era the Tom and Stevie B joined the band and other musical relationships were kindled that would bear fruit in the decades to come. The band had the opportunity to share the stage with notables like John Belushi, Wilson Pickett, Tower of Power, and a host of others. In the late 90’s, East Coast was selected to provide all the music for the wedding of "Mr. & Mrs. New York City” at Grand Central Station! The bride and groom were married by then mayor Rudolph Giuliani, and the ceremony and reception were covered extensively by New York’s Fox 5 TV and the syndicated show “American Journal”. The new millennium brought high profile events performing for and with many celebrities from the entertainment, sports and political worlds: Jon Bon Jovi, Billy Joel, Vanessa Williams, John Belushi, LL Cool J, Russell Simmons, Matt Lauer, Jerry Seinfeld, Martha Stewart, Mookie Wilson, Ron Guidry, Michael Kaye, Dikembe Mutombo, Sean Hannity, Bill O’Reilly, Rudy Giuliani, Mario Cuomo, George Pataki and Justice Ruth Bader Ginsberg to name but a few. With a loyal client list that includes Sony, Citicorp, ESPN, Deutsche Bank, PriceWaterhouseCoopers plus many hundreds of other groups, organizations and individuals, choosing East Coast for your next wedding or event should be one of your easiest and most confident decisions! East Coast has also had a knack for assembling and developing great talent. Back in the 80’s, soundman/trombonist Greg Rubin latched on with Harry Connick, Jr. and Roberta Flack as FOH sound engineer. In 1998 EC vocalist Maria Christiansen co-wrote “Waiting for Tonight” for Jennifer Lopez. In 2003, Henry Haid landed the principal position in Twlya Tharpe’s Tony award winning musical “Movin’ Out” and performed the Billy Joel/Piano Man role until the show closed in 2005. 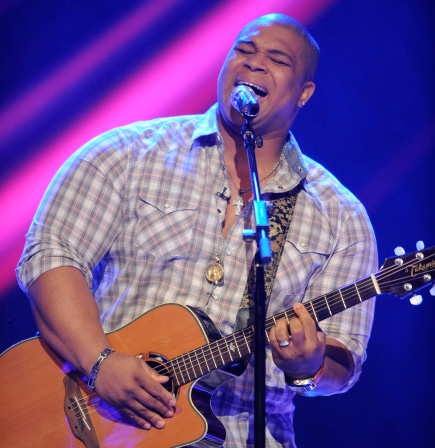 The latest East Coast milestone had us all tuning in to American Idol Season Nine (2010) to watch our “Big Mike” Lynche make it all the way to number four. In case you missed in, you can watch the video here. Michael is busy with recording and film projects but is still performing with the band on select gigs. He is but one of the many other great people who we’ve been so so very blessed to count as part of the East Coast family, a family that keeps getting bigger and better all the time!